Planning is my forte. I sometimes think I'd always get what I wanted if I always followed my little strategies. Unfortunately, my plans show little sympathy for human impulses and my own extreme lack of self control. So although I had exams and I was but three short months from leaving forever, I took no heed of my own sound advice. So I can forgive my friends for refusing to believe I'd stick to my plans this time. But this time, I did because thousands of miles of ocean is a better enforcer than my will will ever be. My plans also mean that I frequently have lame, sentimental plans. But really, the first or last or birthday or Christmas time you see someone has no real significance and will only have such significance by chance. Still, I'm a story perfecting child at heart. Thankfully, luggage and time and tiredness got in the way and so there was no gallery wandering or tennis watching or any other 'special' crap. 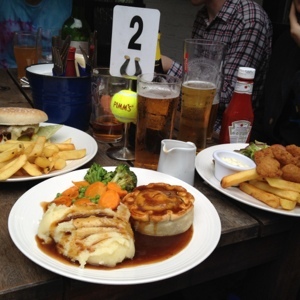 We went to the pub and ate and drank with friends, as we did on every other day. And that's the way it should be! This took place at the Hand in Hand in Wimbledon. Since a pub lunch at the Old Black Horse where I'd corrected my previous food envy and ordered fish and chips when I really wanted mash, I'd been craving mash based pub lunch. Pie and mash specifically. It was the epitome of the lunch I wanted. vegetables, perhaps a little stewed but lovely and sweet, cutting through the rich gravy. Not too much crust on the pie (it's so dire when that happens) and the crust was light and salty. But not too salty! The beef was almost stringy in its tenderness and you could taste the ale. Good mash: non-lumpy, buttery. It was all very laid back and enjoyable but nothing special, exactly how it should've been.